In April 1948, R. M. Beavan, the Assistant Director of the Middle East Department of the British Council, wrote to Rupert Hay, the British Political Resident A senior ranking political representative (equivalent to a Consul General) from the diplomatic corps of the Government of India or one of its subordinate provincial governments, in charge of a Political Residency. in the Gulf, informing him that the Council had received funding in order to arrange a six-week tour of the UK for a visitor from ‘Bahrain, or from any of the territories with which you [Hay] are concerned in the Gulf’. In the letter, Beavan asked for Hay to nominate an appropriate candidate to join the tour and stipulated that in order to justify its subsidization by the Council, the candidate selected ‘should be a person of standing in his profession or trade and likely to exert in his own sphere a considerable influence which may be strengthened and widened by a visit to the UK’. The British Council had been established in 1934 in order to promote Britain’s interests overseas through the medium of culture and education. Alongside its involvement in English-language teaching, arranging speaking tours, holding exhibitions and establishing libraries and cultural centres abroad, another key aspect of the British council’s cultural propaganda efforts was the organisation of official visits to the UK, such as the one that Beavan proposed. Following his receipt of Beavan’s letter, Hay wrote to Cornelius James Pelly, the British Political Agent A mid-ranking political representative (equivalent to a Consul) from the diplomatic corps of the Government of India or one of its subordinate provincial governments, in charge of a Political Agency. in Bahrain, asking him to recommend potential candidates for the tour. In May 1948, after Pelly had discussed the matter with Charles Belgrave, Adviser to the Ruler of Bahrain, Shaikh Salmān bin Ḥamad Āl Khalīfa, he put forward Shaikh Khalīfa bin Mohammed Āl Khalīfa, the Superintendent of the Bahrain State Police (and a cousin of Shaikh Salmān) as his preferred candidate for the tour. Shaikh Khalīfa had demonstrated his loyalty to the British two years before when, upon receiving US Government propaganda pamphlets in the post, he had taken them straight to the then Political Agent A mid-ranking political representative (equivalent to a Consul) from the diplomatic corps of the Government of India or one of its subordinate provincial governments, in charge of a Political Agency. in Bahrain, Arnold Crawshaw Galloway. This expression of allegiance combined with his prominent and influential position as head of Bahrain’s police force seemingly made Shaikh Khalīfa the ideal candidate. Hay immediately agreed with Pelly’s suggestion and then requested that an application form with Shaikh Khalīfa’s full details be sent to him so that he could return it to the British Council and preparations could be made. Subsequently, arrangements were made for Shaikh Khalīfa’s tour, which due to his position as head of Bahrain’s police force, was to be focused on ‘police methods and administration, Scotland Yard, prisons, reformatories, courts, police training schools [and] juvenile courts’. Eventually, a six-week programme beginning in mid-July was agreed and Shaikh Khalīfa arrived in the UK (via a BOAC flying boat) on 14 July 1948. 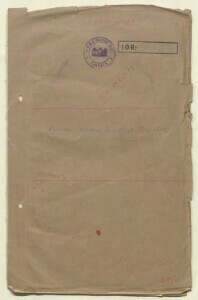 Several months later, on 29 October 1948, after Shaikh Khalīfa had returned to Bahrain, Hay wrote to Pelly stating that as the British Council went to ‘considerable trouble and expense over Shaikh Khalifah’s visit to the United Kingdom,’ they would expect in return a report ‘of the general impression made on him and the benefits that he derived from it’. In reply, on 9 November 1948, Pelly wrote that he was sure that the visit ‘was successful generally in broadening Shaikh Khalifah’s outlook and particularly in giving him an idea as to how a police force ought to be run’. As for Shaikh Khalīfa himself, Pelly stated that the general impression made on him by his visit to the UK was that ‘the spirit of the people there is very high despite their difficulties’ and that he had been ‘particularly struck during his study of police work with the latest methods of crime detection and with the efficiency, economy in man power, and unobtrusiveness afforded by the proper use of motor transport and radio by the police’. As well as being an informative example of the manner in which the British Council utilised official tours of the UK in order to spread pro-British sentiment amongst prominent individuals abroad, Shaikh Khalīfa’s trip of 1948 also provides an early example of the cooperation between the British and Bahraini governments in the field of police and security that has endured to this day.